Sangay National Park contains two active volcanoes (Tungurahua and Sangay) and ecosystems ranging from tropical rainforests to glaciers. It is home to the endangered spectacled bear and mountain tapir (both only found in the Northern Andes). The park is located in the Morona Santiago, Chimborazo and Tungurahua provinces of Ecuador. 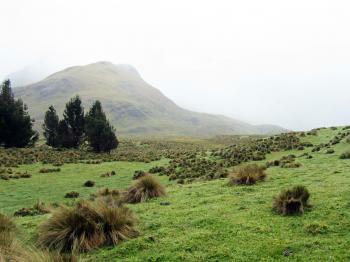 Sangay National Park is a rarely visited WHS in the central highlands of Ecuador. Only 17 community members were there before me, resulting in a 874th spot at the ranking of Most Visited Sites. That’s less than Zabid (Yemen) or Ilulissat Icefjord (Greenland) for example. It would be interesting to find out how the other visitors approached Sangay, especially before the controversial construction of the Guamote-Macas road. I did it the same way as the only other reviewer so far (Jay T): with a car and driver/guide arranged by Julio Verne Travel in Riobamba. They also advertise downhill bike tours along that road, and can arrange multi-day hikes into the area. The WHS covers only about half of Sangay National Park: the most restricted area. When you drive along the Guamote-Macas road, you’ll be in the core zone for only 8 km. The map from 2009 at the UNESCO website clearly shows the road at the southwestern tip, plus a lake system called Lagunas Magdalenas right beside it. Confusingly, their popular name is the Atillo Lakes (named after the nearby village). 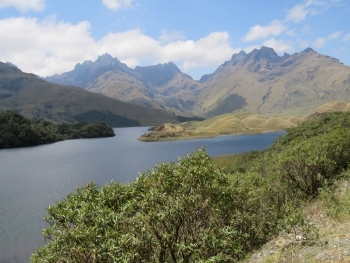 The outline of my day trip was to visit these lakes and drive on all the way down the Guamote-Macas road to a town called 9 de Octubre, to see the landscape change from subalpine Páramo grasslands to subtropical rainforest (one of the key features of this WHS). Driving up from Riobamba, the scenery starts with rich agricultural lands. The lava soil is nutritious. One of the main products that is created and transported from here is fertilizer. Other crops include strawberries, potatoes, cabbage and tree tomatoes. There are even numerous greenhouses, used for growing ‘normal’ tomatoes. The scenery only changes slowly after having passed the “Welcome to Sangay National Park” sign. There still are numerous villages almost all along the road. The lakes are located at 3,466m altitude. A cold wind is blowing here all the time. I only noticed one duck braving the water. We got out at the parking lot near the Black Lake, a separate lake from the Magdalena lake(s) – deeper and thus darker in colour. A small trail leads up to a hill top from the parking. We climbed it and enjoyed the views some more. We were so blessed with the weather today, even the guide was taking lots of pictures as it rarely is as clear here as it was this day. There is so little traffic on this road that we could stop when and where we wanted. According to the guide, rangers still do spot wildlife along the road. The most sought after mammal of course is the mountain tapir, the mascot of the park. These tapirs (mountain tapirs and ‘normal’ ones) are called “danta” in Spanish, and we even saw a sign that we had to be careful driving because of danta crossing the road. Well, we only wished to see one! We had to make do with two vultures having a snack along the side of the road. The three volcanoes inside the park – Sangay, El Altar and Tungurahua - are difficult to see from this side. Just past the town of 9 de Octubre there's a viewing platform which supposedly has good views - but it was much too hazy when we arrived around lunch time. In Riobamba, there’s always the Chimborazo volcano west of the park that draws all the attraction. Other snowclad volcanoes rarely come into view. From the road not far from Riobamba my guide pointed out El Altar, the extinct one that has collapsed and isn’t as pretty as the other two. I saw it again the next day from the road while I was on my way to the market in Guamote. Tungurahua should easily be seen from the north (Baños, or possibly even the road to Quito). Sangay however will stay a well-hidden secret to most travellers. The road through Sangay National Park is a fait accompli, providing a quicker route to the Ecuadorian city of Macas, east of the Andes. I can't speak to the ecological impact of the road on the park, but it did provide an easy way to access the Atillo Lakes region of the park, where I spent a couple of hours hiking in the Andes last month. The weather was not the most promising, with low, grey clouds obscuring the volcanic peak of Sangay; rain held off, however, and at times the sun did its best to disperse some of the cloud cover. My driver arranged for a local guide, Dora, to lead a hike through a high mountain valley to the first of the Atillo lakes. The region serves as a watershed for the western Andes, and the hills were marshy and covered with grasses and wildflowers; I was very glad my tour company provided rubber boots for the hike. The lakes themselves are very popular with local fishermen, and with all the rain the Andes have had this year, there were several waterfalls flowing on the mountains above the valley. Although the park has some larger species of wildlife, including spectacled bears, foxes, and tapirs, the largest wildlife I saw were ducks. While I would have liked a better day for the hike, I enjoyed my brief tour in the upper reaches of the Andes Mountains. Maybe if I return one day I'll get to see Sangay mountain on a sunny day. Logistics: Sangay National Park is a little more accessible thanks to the Guamote-Macas road, but it still requires either private transportation or planning for local buses. I hired a driver through a Dutch tour company in Riobamba, which is the closest major city to the Atillo Lakes. Yes, as a wildlife ecologist studying the endangered mountain tapir in Sangay National Park, I fought against the egregious Guamote Macas road but the road prevailed due to the violent threats the official received from the road's proponents. This was surely a triumph of ignornance and irreverence for life over wisdom and reverence for life. The Purshi Valley was one of the highest virgin Andean forests, reaching the way to Laguna Negra at over 4000 meters elevation. It was a safe haven for the endangered mountain tapirs. Here they bred and conducted their very benign million-years-old life style, seeding many plants and helping to build rich, humus containing soils. It is such a shame that the Guamote Macas Road was ever constructed, and I pray that an earthquake utterly destroy this abomination! Then the lovely paramos and cloud forests of this enchanting region can restore themselves and the destructor man will be excluded. Only those who enter with respect to observe and not to destroy will be allowed. This was, after all, the true law and international agreement that the government of Ecuador pledged to uphold in this region. So much for broken promises! What a disgrace! The best value of this region is to let all the many species who live here and have for millions of years, and including many wonderful orchid species, carry on in their uniquely beautiful and harmonious way! My name is David Hlatky, I have dual citizenship (Ecuadorian and Australian); I grew up in Ecuador and lived there until I was 24 years old. When I turned 24 I finished my Uni degree and travelled to Australia to further my studies and eventually finished my master's degree in Environmental Management. I have (sporadically - some time ago now) been in contact with Craig Downer from the Tapir Foundation and Mark Hockings from the United Nations. I wanted to emphasise the fact that the national park is being exploited by increasing human settlements all along the Guamote - Macas Road. The national park is shrinking all along the road and settlements are going deeper and deeper inside the National Park. If no action is taken is only a matter of years before we lose critical habitats and species within the park. I hope this letter is added to a number of claims already made from interested parties; I hope this claim does not fall into deaf ears. 2.5: Solivagant Jay T Randi Thomsen Peter A. Recently Active Volcanoes: Tungurahua "During the past 1300 years eruptive episodes were generally once per century, and commenced with .... pyroclastic flows, followed by lava flows.. . This cycle was observed in the largest historic eruptions in 1773, 1886 and 1916-1918". There were also recent eruptions in 1999-2008 and 1944". Eruptions in January 2008 forced the evacuation of 1000 people. Two large eruptions occurred on 6th February 2008 with ash to 47,000 ft altitude. Sangay is one of the world's most active volcanoes with a current active cycle from 1934 to present. On 12th August 1976 and eruption killed two people and seriously injured three, from a British expedition team. Amazon Basin: "Major rivers drain eastwards into the Amazon Basin"
Exact locations inscribed twice (or more): A stretch of the Qhapaq Nan passes through it.